i too have a 02 SE. would like to see what others have done to theirs. Mine is stock at the moment. considering the AC 2" lift. I do a lot of towing(mostly light weight), and my suspension is wore out after 135k. Here is mine...I've owned many different cars and trucks, this is my first SUV and I just love it! It's stock height with 31x10.5s just barely rubs. My plans are to get a less cheap roof rack, maybe cargo pod? 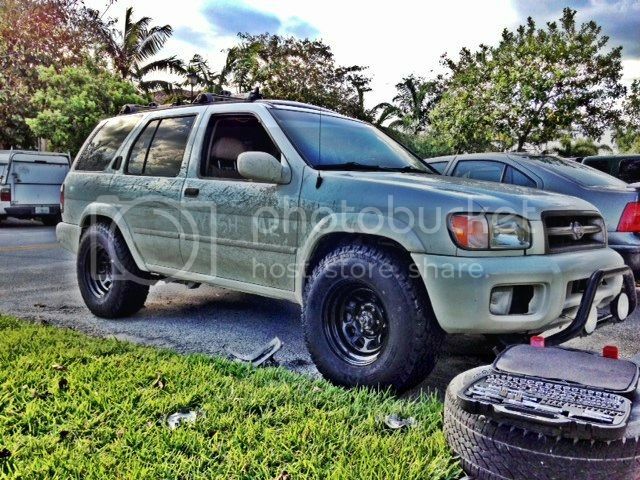 More aggressive tires and if I have my way, a new front bumper with winch! If my next set of tires are more aggressive...like BFG M/Ts will I be able to keep the same size or will I have to go smaller due to the increased tread? 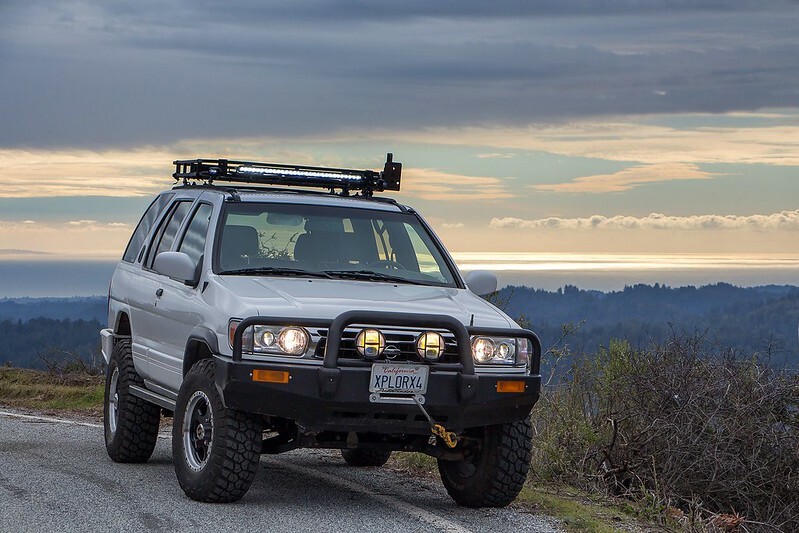 Anyone removed this style stock roof rack for the other style oem? Or Maybe even a yakima or Thule? Just don't think adding roof rack attachments on top of my style oem looks that great.. If it is like other Nissans there are probably nutserts in the roof and the rack will just unbolt. I pulled the racks off a Frontier and Xterra with no problems. Give it a shot! Hi all, I have been a long-time lurker on ExPo, but I finally decided to actually register only about a week ago. This thread and other R50 builds inspired me to add my 97 Pathfinder LE to the mix. My Pathy has grown to what it is today over a period of about 12 years, much of the work having been completed by 2007, with the only change since being swapping IPF 630RV lights for Rigid LED lights on my roof rack. 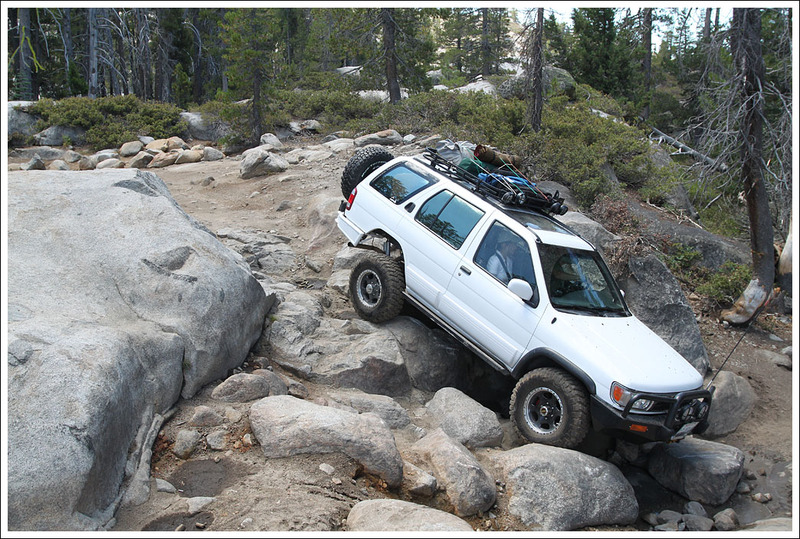 Note that this type of off-roading normally doesn't qualify as "Expedition Portal" fodder, and is usually associated with the likes of "Pirate4x4". However, it demonstrates that even even a mildly-lifted (only 2") R50 is quite capable. Gorgeous rig! I've been admiring it on NPORA every time I see it. Welcome to ExPo, it's an excellent group! I'm glad to see you still have your R50 after all this time. You inspired me to modify my first R50 back in 2006. And now my 1997. I've always looked up to you and hope to one day have a similar setup as yours. 99% done, 4x4 tested, everything works: passed OBDII smog, A/C, cruise. Crazy!! What front axle is that? Dana? Dana 44 high pinion full width from the 78-79 Bronco. It actually sits a bit lower than when I had the drop lift suspension. 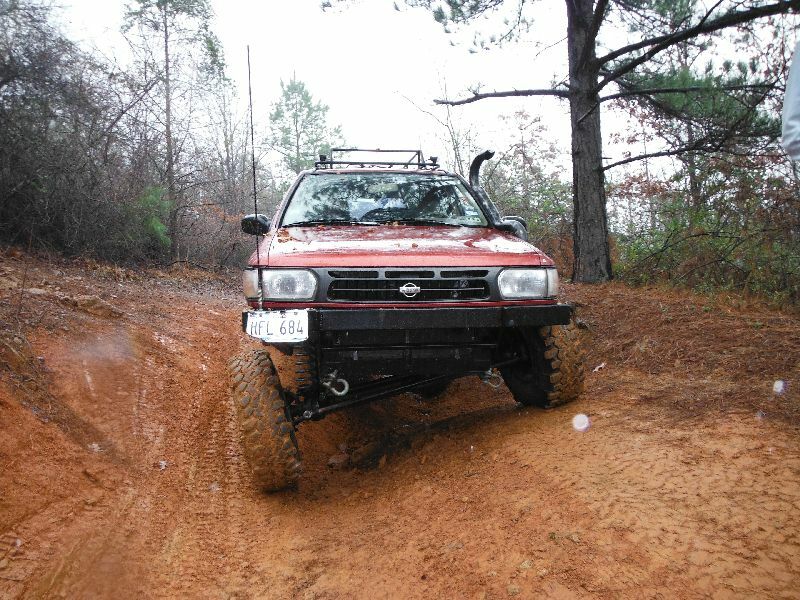 The focus was on an overland vehicle with reliability NOT a crazy rock crawler. The biggest problem is that it is loud on the highway, but this is due to a bad exhaust system and some rear interior panels I have removed but not yet reinstalled. I also have some driveline vibrations as the engine is 1" lower but the transmission is not. This will be solved with a new rear driveshaft. Here is the full web album of the first test trip. I sincerely dislike mud, but this is what we had after it rained. The truck exceeded my expectations and even without a front locker followed my friend's dual locked XJ where ever he went. I might be a little late to this thread/site but I have owned my Pathfinder for about 5 years now and am just starting to "mod" it. I added some 255/65/16 DynaPro ATM's to it about a year ago and some new rear rancho shocks. 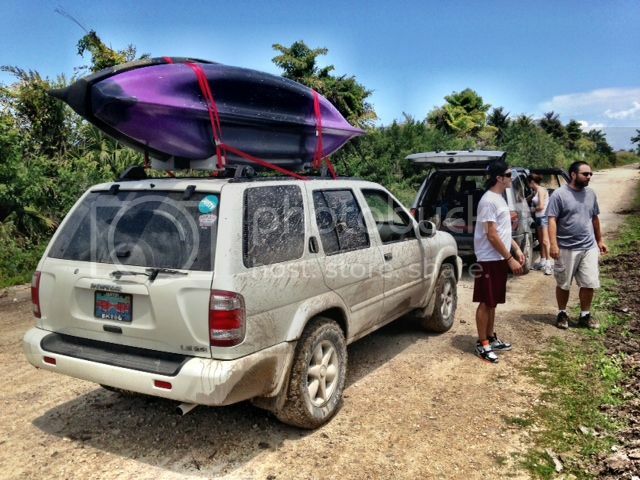 Other then that just a kayak rack and have been having some fun in it. Just recently ordered some 32" Grabbers and some 16x8 steels and a AC 2" lift which only the rear coils have arrived due to 4x4 being out of stock on the front coils. But Here is a picture of the 32's at stock height, they fit but I wouldn't be able to put any load in the rear or turn my front wheels haha.. So it will sit in the driveway till the rest of the lift arrives (2-3 weeks I was told).